1.1 oz / 32 ml $12.91 ORGANIC. PART OF PLANT – Peppermint Leaves. Cooling and calming to inflamed skin, especially sunburn, and to inflamed muscles. One of the most medically advanced ancient cultures, the ancient Egyptians, have documented the use of Peppermint Oil, from nasal relief, to digestive calming. 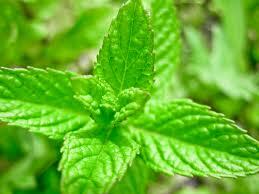 Peppermint Oil has also been found in several Egyptian pyramids. Peppermint Oil is also mentioned many times, as having a wide variety of medically healing properties, in Japanese, Chinese, and Roman records. Peppermint is the most concentrated of all the hundreds of Essential Oils, and is the only oil that is recommended to be used in half the dosage of all other Essential Oils. Respiratory decongestant – clears sinuses and opens breathing. Anti-nausea – reduces nausea, indigestion and colic. The “Exam oil” – an excellent oil to increase mental concentration and energy levels. Scalp problems – anti-lice / anti-dandruff. SPECIAL – Enhances sensual pleasures. PRECAUTIONS – Do not use if you have high blood pressure / Avoid in pregnancy, or if you are trying to fall pregnant / Do not combine with Homeopathic remedies. EXTRA PRECAUTION WHEN USING PEPPERMINT OIL – THIS IS THE ONLY OIL WHICH, while blending,YOU MUST USE HALF THE AMOUNT OF DROPS that you normally use. So, if you normally use 12 drops in the bath, instead, use 6 drops. And, if you normally use 10 drops in 1 oz of carrier oil/body butter, instead, use 5 drops. By following the above blending doses, you will ensure that Peppermint Oil has the cooling and calming effects, for which it is so famous. Failure to observe these special instructions, will cause Peppermint Oil to irritate the skin. ADULT DOSE: FIVE DROPS, per thirty milliliters (one ounce) of carrier. 6 TO 12 YEAR OLD : TWO drops, per thirty milliliters (one ounce) of carrier. 3 TO 6 YEAR OLD : ONE drop, per thirty milliliters (one ounce) of carrier. BABY DOSE : HALF A DROP drop, per sixty milliliters (two ounces) of carrier. 4. For Bath, place 3 to 6 drops in bath, mix evenly through the water, then soak for 15 minutes. Be sure to rub the blended oil into the correct parts of your body, in order to obtain results. If you have a tense ‘spot’ on a muscle, apply the oil to the entire muscle group, not just to one ‘spot’. You may apply your Peppermint Aromatherapy blend, three times a day, for best results.